Once each of the 8 categories have been assessed, the total is calculated to determine the severity of ataxia. 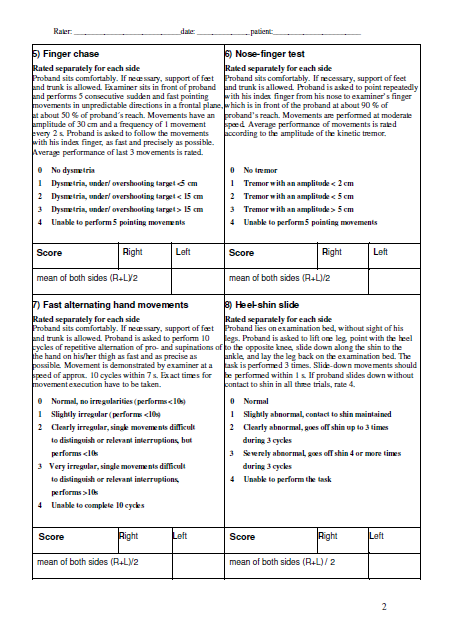 For motor activities of the four extremities (items 5-8), assessments are performed bilaterally, and the mean values are used to obtain the total score. ↑ Trouillas P, Takayanagi T, Hallett M, Currier RD, Subramony SH, Wessel K, Bryer A, Diener HC, Massaquoi S, Gomez CM, et al. The Ataxia Neuropharmacology Committee of the World Federation of Neurology. International Cooperative Ataxia Rating Scale for pharmacological assessment of the cerebellar syndrome. J Neurol Sci. 1997;145:205–211. ↑ 3.0 3.1 3.2 Schmitz-Hübsch T, du Montcel ST, Baliko L, Berciano J, Boesch S, Depondt C, Giunti P, Globas C, Infante J, Kang JS, et al. Scale for the assessment and rating of ataxia: development of a new clinical scale. Neurology. 2006;66:1717–1720. ↑ Schmitz-Hübsch T, Fimmers R, Rakowicz M, Rola R, Zdzienicka E, Fancellu R, Mariotti C, Linnemann C, Schöls L, Timmann D, Filla A. Responsiveness of different rating instruments in spinocerebellar ataxia patients. Neurology. 2010 23;74(8):678-84. ↑ Bürk K, Mälzig U, Wolf S, Heck S, Dimitriadis K, Schmitz‐Hübsch T, Hering S, Lindig TM, Haug V, Timmann D, Degen I. Comparison of three clinical rating scales in Friedreich ataxia (FRDA). Movement Disorders 2009. 15;24(12):1779-84. ↑ 8.0 8.1 Saute JA, Donis KC, Serrano-Munuera C, Genis D, Ramirez LT, Mazzetti P, Pérez LV, Latorre P, Sequeiros J, Matilla-Dueñas A, Jardim LB. Ataxia rating scales—psychometric profiles, natural history and their application in clinical trials. The Cerebellum. 2012 Jun 1;11(2):488-504. ↑ Subramony SH. 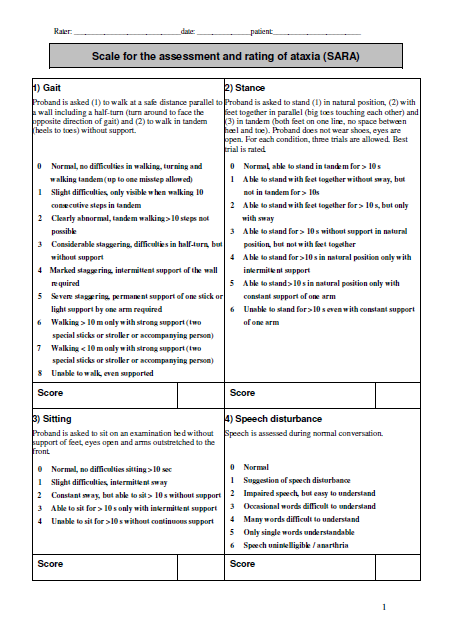 SARA—a new clinical scale for the assessment and rating of ataxia. Nature clinical practice Neurology. 2007 Mar 1;3(3):136-7.